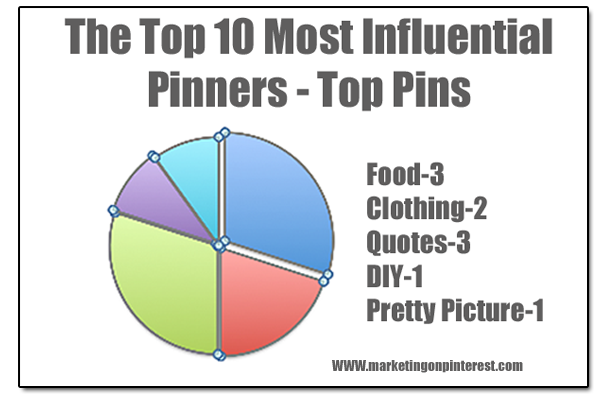 Home › Pinning Lesson › What Types Of Pins Are Most Popular? What Types Of Pins Are Most Popular? What’s the point? Well, the ‘aha’ for me was that quotes were as popular as food, and more popular than clothing. That’s a shocker. Would this hold up if you analyzed a larger sample size? I don’t know. Maybe someone should do it and make a cool infographic. Let me know when you do and I’ll blog about it. ‹ What’s Your Pinterest Popularity Number? you have provide the important information and is more reliable for everyone on site, thanks for posting this type of information. Thanks, I appreciate that! Good luck in your Pinterest work!